Description A mysterious person in a cat suit. Tama, a person of unknown identity, is working inside a cat suit as a by-the-day temp worker in order to buy a certain object she found at a general store. She begins her work of promoting a diet drink, "Burning Hammer." [From [url=https://en.m.wikipedia.org/wiki/428:_Shibuya_Scramble]Wikipedia[/url]] A mysterious person in a cat suit. 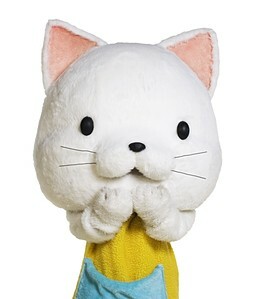 Tama, a person of unknown identity, is working inside a cat suit as a by-the-day temp worker in order to buy a certain object she found at a general store. She begins her work of promoting a diet drink, "Burning Hammer." A mysterious person in a cat suit. Tama, a person of unknown identity, is working inside a cat suit as a by-the-day temp worker in order to buy a certain object she found at a general store. She begins her work of promoting a diet drink, "Burning Hammer." <hidden by spoiler settings>Her true identity is revealed to be Oozawa Maria, Hitomi's twin sister and Kenji's daughter.